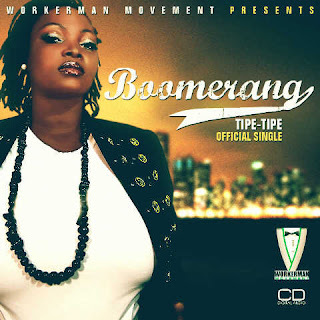 The queen of tha workerman clan, Boomerang drops her new single 'TipeTipe'. TipeTipe, produced by EX.O of CashIN in a build up to her #SweetSexySassy album set for release in september 2013 is her first major single. Boomerang aka BMG aka Michellin bebe aka MamaSan aka Akanchawa Duchess Rap Mayoress aka Double Dee's aka Ologbo dudu is presently cooking up new joints with the likes of SoundSultan, Oritsefemi, CapitalF.E.M.I, Godwon, Yemi Alade, Janeykrest, Sossick, Buckwhylla, Seyishey, Lowkeyz, Olujazz, Kiss, QA and queen mother WeirdMC. Also check out "FlirtyFlirty ft oritsefemi" and "Credit ft JaneyKrest"